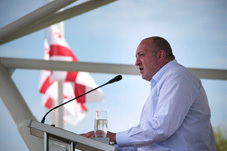 Georgian President Giorgi Margvelashvili stated on the 10th anniversary of the Russia-Georgia war that the country would manage to reintegrate its territories lost during the 2008 war. “10 years have passed since the August tragedy. I would like to remind everyone once again that this was not the first attack on free Georgia. For the first time, Russia tried to punish us in the early years of our independence; it was the war of the 90s, carried out by Russia in Abkhazia and Tskhinvali regions. One more wave of a perfidious attack was ten years ago. “Today, when we think of the past, we see that victory, and the unification of the country is closer. Our morality and faith have not been broken, and the number of our supporters is increased… Every month brings us closer to the unity of the country,” Margvelashvili said. Dozens of countries condemned the Russian aggression in Georgia again yesterday, on August 8, when the Russia-Georgia war started. A phone conversation was held between Margvelashvili and US Secretary of State Mike Pompeo, upon the latter's initiative. As the press office of the Administration of President reported, the US Secretary of State reiterated US's firm support for Georgia's territorial integrity and sovereignty. The US Secretary of State emphasized that the US “will never accept the occupation” of Georgia's territories and will also help Georgia to overcome the challenges that remain ten years after Russia's military aggression in Georgia. Georgia’s Former President Mikheil Saakashvili stated on the day that the war started by Russia to punish Georgia for its democratic advancement. “The rumors as if I had a personal misunderstanding with Putin and the war started because of this, is nonsense. George Bush was right when he pointed out that Putin was too cold-blooded to start war due to personal relationships. I have never had conflicts with him. We always had courageous conversations. He has never disrespected me, "said Saakashvili. He said that Russian President Vladimir Putin was irritated by the successful reforms of Georgia. “He attacked Georgia not because of Saakashvili, but to put a full stop at Georgia’s reforms. I was the symbol of reforms for him,” the ex-president said. Sergey Ivanov, who was Russia’s Vice Prime Minister in 2008, told the Kommersant newspaper that in 2007-2008, Washington and former Secretary of State Condoleezza Rice” constantly assured Russia” that Saakashvili would not dare to escalate the military conflict in South Ossetia. “But after the war, they recognized that Saakashvili had violated all conditions,” Ivanov says. Human loss: 412 killed on the Georgian side – including 170 soldiers, 14 police officers, and 228 civilians. 1,747 wounded on the Georgian side – including 973 soldiers s, 227 policemen and 547 civilians. Three journalists killed, six journalists wounded. 130, 000 Internally Displaced Persons (IDPs) – out of which 26,000 are still denied the right of return. [Overall, the number of IDPs from both occupied regions is now close to half a million]. 35,000 houses burned, ruined and destroyed. 125 more villages have been occupied since the August 2008 war.